Dr. Robson and Team Personally Teach CAs How to be the Most Powerful in the Profession! The training set that can be used for all new CAs and seasoned CAs who want to get even better! After years of being asked, Dr. Robson has finally made an Audio Set explaining and demonstrating exactly how to Communicate, Persuade, and answer Questions POWERFULLY, CREDIBLY and CONVINCINGLY. Over 350 minutes of the psychology, strategies, and angles on how to handle and answer practically any question any person could ever ask you! 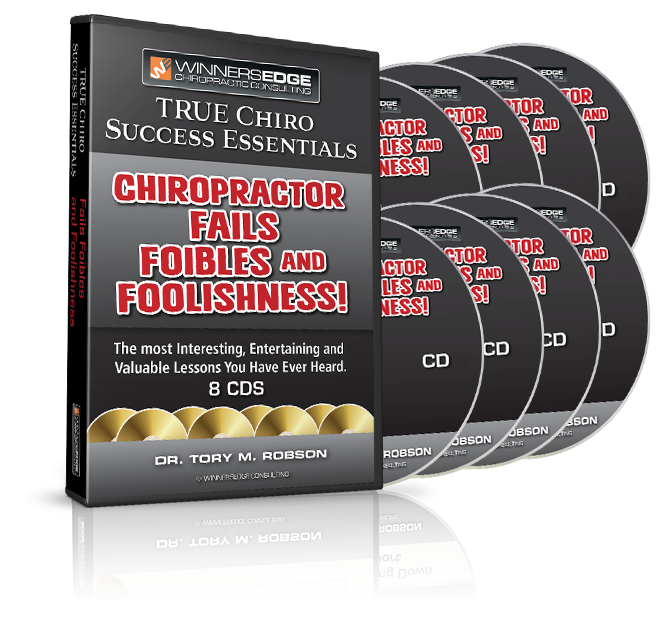 Many consider this the Best CD Set in Chiropractic today! Can't I just use the 12 visits my insurance pays for? Can't I just pay each time I come in? When am I done here? My husband doesn't think I need that much care. My "Doctor" says I should just go get Physical Therapy. I feel pretty good, my spine is probably fine. Do I have to come here forever? I'm late because I had to stop and get Antibiotics for my sons ears. My brother went to a chiropractor and he hurt him, so I don't ever want to see one of you guys. I just got an MRI and it shows I have a bulging disc, so I need to quit seeing you. So with all this care, when will my X-rays be straight again? Why won’t it be straight again? It seems like I’m paying a lot of money for something that only takes a minute in here. My Doctor said it is okay to see you as long as you don't touch my neck. You MUST be able to answer all these and MANY more perfectly! These CD’s will show you exactly how! You can get more New Patients practically at-will just by turning up the power on the NPG System! Yes, we know it sounds good. Remember, Dr. Robson is a master direct response marketer. He has been able to build an incredible practice without ever really leaving his office. He is a master of creating the systems that when put in place, do the work for you! If you can type your name, take a picture, find an Office Supply store, or send a letter, then you have all you need for this to work for you. I mean really work. You do this right, get your office running right, and you will never have to do any other marketing ever again. Dr. Robson's New Patient Generator System is the best in the profession for bringing: Direct patient referrals, patient referrals from home, patient referrals from work, new patients from local residences, new patients from businesses next to your office, new patients from any business, school, organization in your radius, PLUS includes the perfect material to use at any event or for any situation where you want to spark a referral and a new patient. This system will seem very simple to you once you get it. But realize, it is impossible to duplicate. We have never seen anything like this ever in chiropractic. It is essentially Dr Robson’s primary marketing secrets revealed in one simple to use, effective program that can be done forever with little cost and high return. 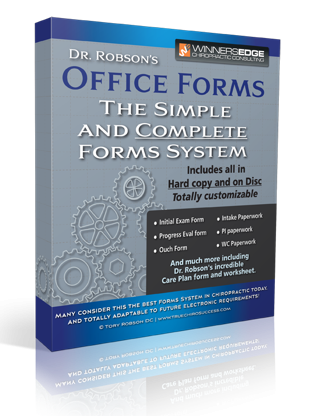 Our COMPLETE Forms Package with color-coded Hard Copies Plus a CD with all WORD files so you can personalize them and print right now for your office. Fifteen years in the making this is the best forms set we have ever seen. No more winging it! Get these and be done with it for several years! Time tested, volume tested, attorney tested, CA tested, Dr. tested. New Patient, Medicare, PI, WC, Exam, Progress Eval, The best Travel Card ever invented, Initial Report, and more. Inferior sets sell for over $1000! 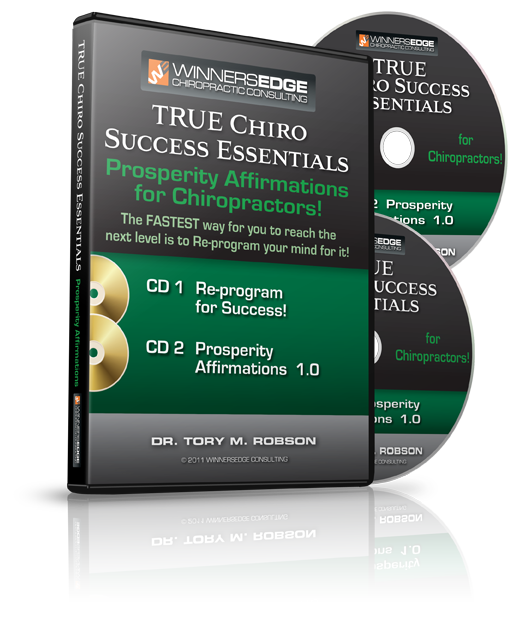 Dr. Robson touches on how to run a tight and profitable practice that prospers for years! Do you have an overhead problem? What is GOOD vs. what is BAD overhead? Is it possible your overhead may actually be too LOW? How to pay the least tax and take home the most. Legally of course! Avoiding the biggest overhead mistakes that nearly all DCs make! How low can you get your practice overhead and still grow. How to organize your billing and bill paying perfectly. Account and Payroll made ridiculously simple. How getting good at this will cause you to collect MORE! A Chiropractor asked Dr. Robson this question: Tory, if you were to come to my office for a month, what would you do to make it grow? This is how Dr. Robson started with a bare floor, only knowing 3 people in the area, and was at 100 visits a day in under 12 weeks! This set has the best marketing and promotion activities that you can do right now, TODAY to build a huge network and endless stream of new patients. For the first time ever you will SEE all the marketing opportunities that you never saw before. The mindset required to attract massive new patients. How time between patients is your best marketing time. How your local weekly paper can make your more popular than ever, practically for free. Why the regular mail is the mot valuable tool for the future. What is Moment by Moment Marketing and why it is so incredible. How to turn each patient into several more every week! The exact wording to say when it counts. 100 different marketing tactics that you have never seen before. CDs to listen, manual to read and DVDs to bring it all together! Includes 8 CDs, 4 DVDs and Manual! What to think, say and do to take your Chiropractic skill to the next level! Hands on skill is a lost art in Chiropractic today. Reclaim it now! All patients featured in videos authorized the use of their footage. The ultimate office visit experience. The mindset to get better results. Why footwork and "eyework" are critical to technique. Atlas, C7, T4, T12 and L5. Don't stray too far! How technique makes or breaks your treatment time! Special: How to master seated cervical adjusting. The best way! Dr. Robson personally demonstrates with real patients! Your Treatment Time Controls Your Practice and Your Life! Learn exactly how to cut your time and double or triple your practice… Literally overnight! CD 1: What is the Treatment Time problem? Hint: It’s You! CD 2: The exact steps and methods to get your Treatment Time right, with better results! 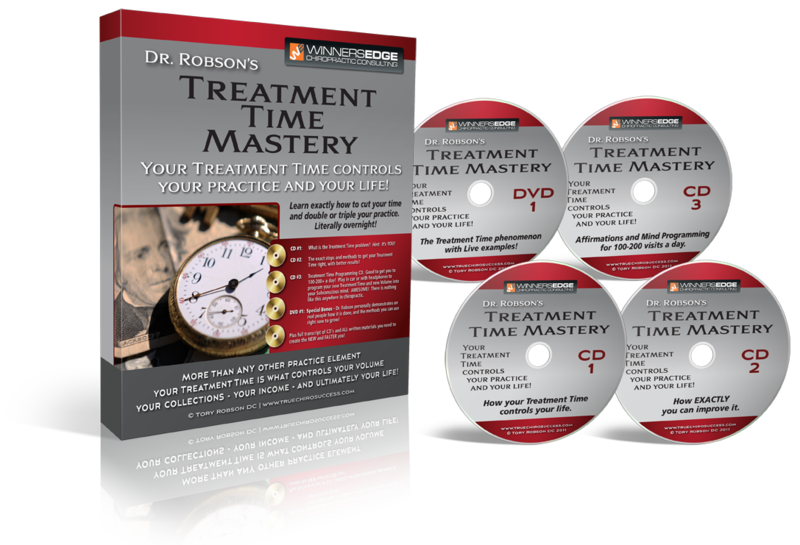 CD 3: Treatment Time Programming CD. Good to get you to 100-200+ a day! Play in your car or with headphones to program your new Treatment Time and new Volume into your Subconscious mind. AWESOME! There is nothing like this anywhere in Chiropractic! 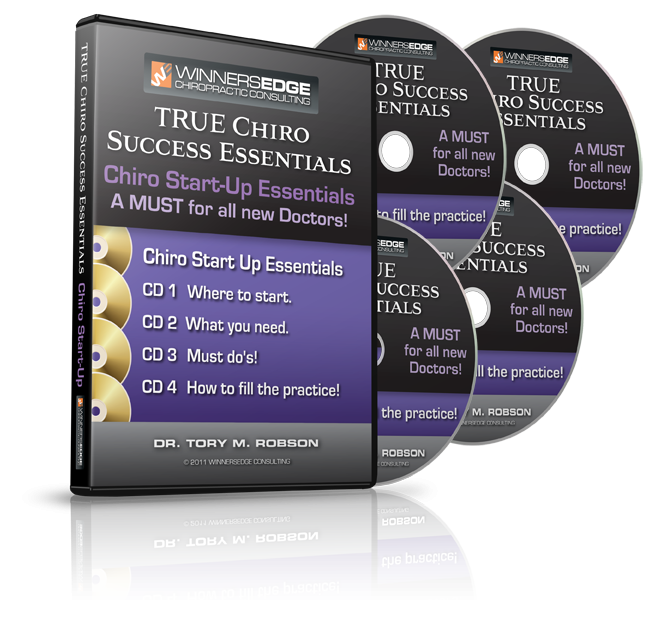 BONUS #1: A DVD of Dr. Robson personally demonstrating on real people how it is done, and the methods you can use right now to grow! BONUS #2: Full transcripts of CD’s and ALL written materials you need to create the NEW and FASTER you! Do you ever wonder how some DC's just seem to naturally attract new patients? Did you ever wonder what they say, what they do, and how they think that makes it so effortless for them? Well here it is! 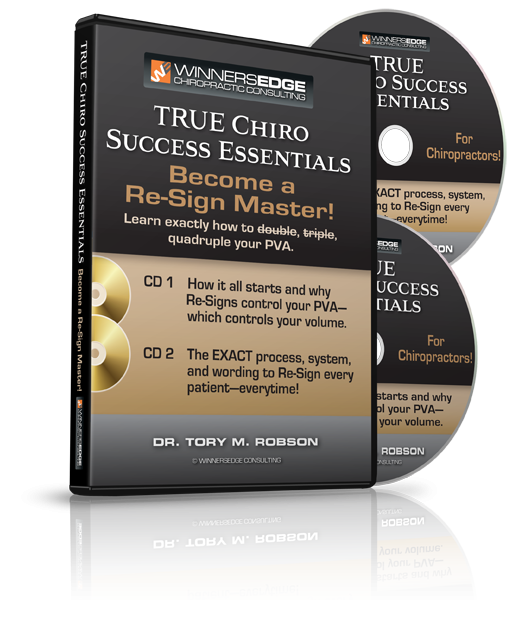 One of the most powerful CD sets in Chiropractic today! Learn the mindset and motivations that cause YOU to attract more people to you into your life and, more importantly, into your office! This multifaceted dissertation by Dr. Robson will inspire you and reveal to you that you can do it too! Start attracting more new patients to your office TODAY! 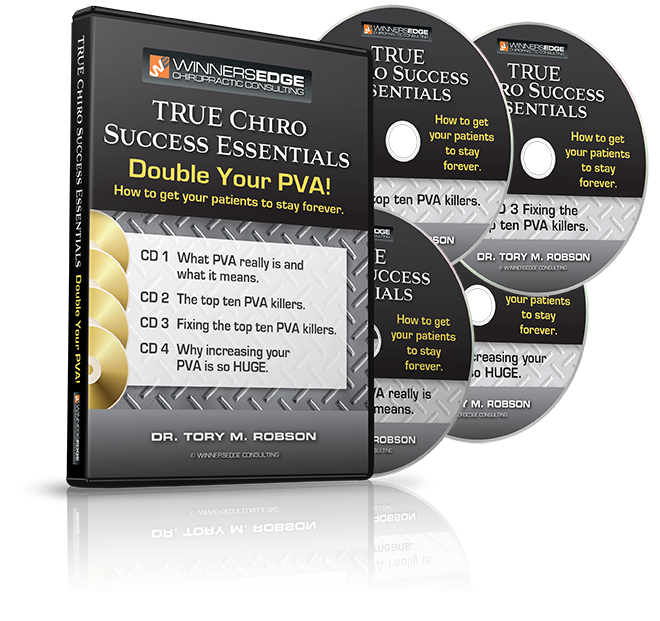 If your PVA is under 40 you need this CD set immediately! Your ability to get patients to continue care is the key to your volume and practice stability. This CD set explains the exact process and words to use to get patients to tell you they want to continue care vs. you trying to tell them to come back. This will change your practicing life as it will increase your PVA - and your volume - and your collections! CD 1 How it all starts and why Re-Signs control your PVA – which controls your volume! CD 2 The EXACT process, system, and wording to Re-Sign practically every patient - every time! Learn how to crush old poverty concepts and replace them with your own new prosperity consciousness! CD 4: Programming YOU for Prosperity! 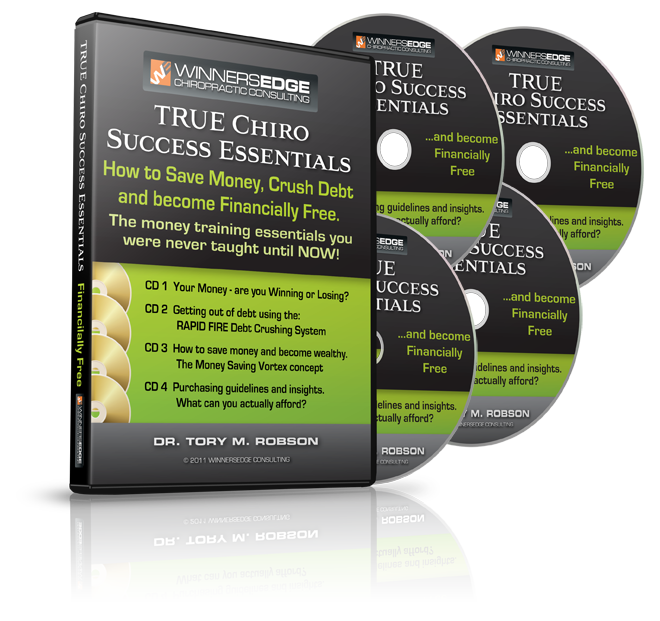 If you have any desire to grow financially then get this set today! This material is a MUST to save you from the countless pitfalls and landmines that ruin many dreams. Do it right the first time! Perfect for ALL students in any Tri. The sooner you know what to do the better, no waiting! What would it be like if your referrals doubled? Discover ALL the different sources of referrals you have available to you. Hint: There are a lot more than you think! CD 1: Are you getting as many referrals as you would like? CD 2: Referral generation mastery. 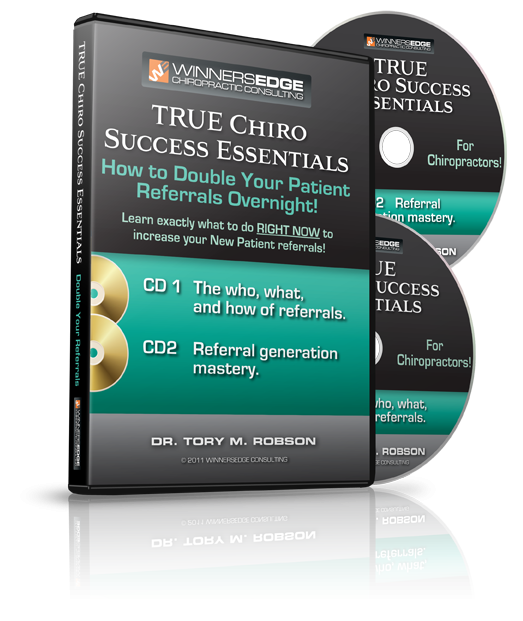 Dr. Robson teaches you EXACTLY how to generate in-office referrals at the highest level. Want to grow your practice? This is the FIRST thing you need to get good at! 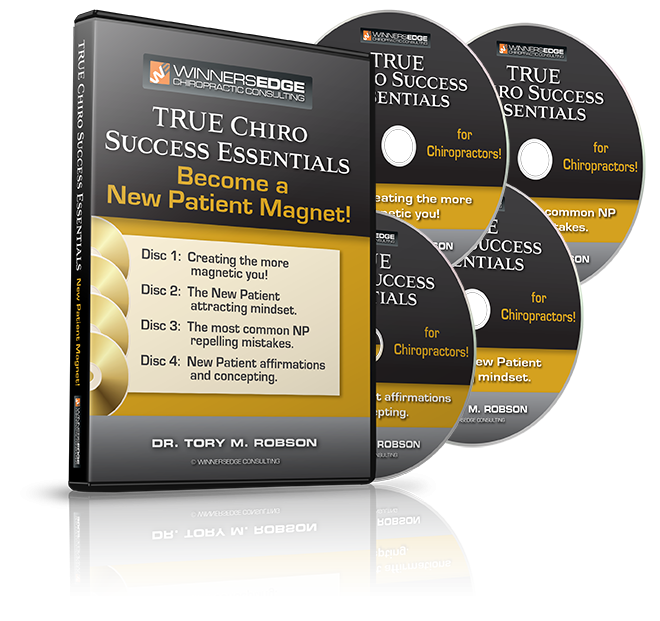 Long awaited CDs on exactly how to get your patients to stay forever. CD 1: What PVA really is and what it means. CD 2: The top ten PVA killers. CD 3: Fixing the top ten PVA killers. CD 4: Why increasing your PVA is so HUGE. PVA really is the key to growing volume, collections, and future practice stability. All DCs need this set! The most interesting, entertaining and valuable lessons you have ever heard! 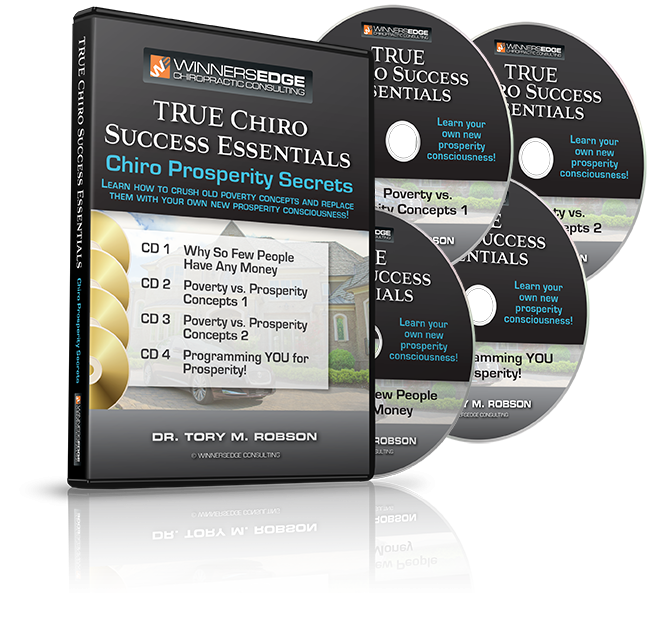 Incredible wisdom gained from 30,000 calls with chiropractors! What you learn here can be worth MILLIONS to you. Super successful DCs learn from others mistakes! Audio set designed specifically to create World Class CA’s! Listening to these CD’s will give your CA’s the training, motivation, mindset, and philosophy that makes a powerhouse Chiropractic Team! Dr. Robson personally teaches the Purpose, Attitude, Key procedures, Definitions, much needed Chiropractic History and Philosophy, Do’s and Don’ts, Coding, Billing, Care Plans, how to stimulate Referrals, and how to totally support the chiropractic mission and go after the goals in your office! An absolute must for all CA’s. CD 1: Chiropractic Affirmation CD designed to program your mind for gratitude, confidence, and 100+ patients per day! Are you serious about growing? Remember, we are guided by our subconscious mind. This CD will re-program your subconscious mind to a new level. This is the ONLY chiropractic specific affirmation CD we are aware of and is quite likely the single best CD in chiropractic today! Listen to it over and over and watch what happens. 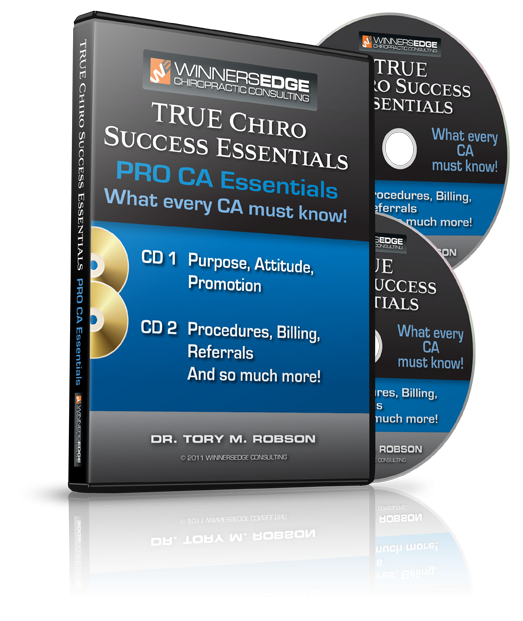 CD 2: Training on the most powerful PRO Chiro statements to use with patients along with the ultimate in Referral generating statements PLUS how to handle ANY objection a patient might throw at you. Awesome! An absolute must for all DC’s. This killer new affirmation set is the follow-up to our popular PRO Chiro Talk! 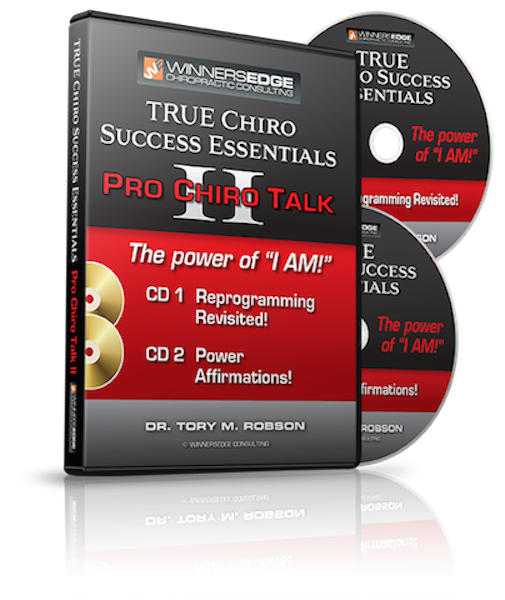 Dr. Robson delivers the latest in success programming along with an affirmation CD anchored by the two most powerful words on earth: I AM! 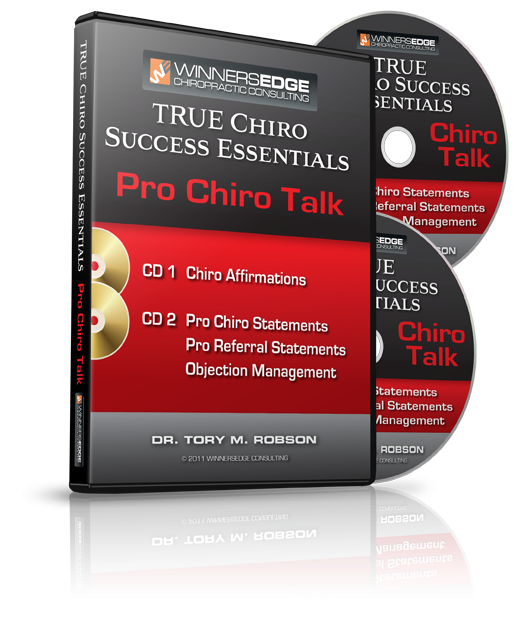 Make sure you have the original PRO Chiro Talk first - then for sure add this to your success collection! We recommend you listen to one of our affirmation CD's every day on your way to the office - it really works! Are you wanting to grow your practice? Your ability to promote and market yourself AND your practice is the lifeblood of your success! Discover why paid advertising is NOT needed after 100 visits a week when your practice has the right intention and runs right. Learn how to Re-program your mind to reach your NEXT level of success. The easiest way to spark serious growth! Repetition is the first law of learning, the affirmations here will literally program your mind to the Million Dollar level. CD 1: Discover how our minds are negatively programmed every day by the media. Learn how to regain control of your mind and program it with what YOU want! CD 2: Prosperity Affirmations for DC’s. Will program you to a new level of prosperity, thankfulness, and power. Know it! These CD’s are powerful beyond what most understand. Listen and you will see. This is perfect for ALL practicing DC's and especially those who are bored, frustrated, and ready for a change. CD 1: THE PROBLEM Why You Are Stuck. Do you want to recharge and re-ignite your practice for the future? Every Chiropractor at different times in their practice feels stuck! Understanding how this happens is the key to NEVER letting this happen again! CD 2: THE SOLUTION How to Re-Charge right now! 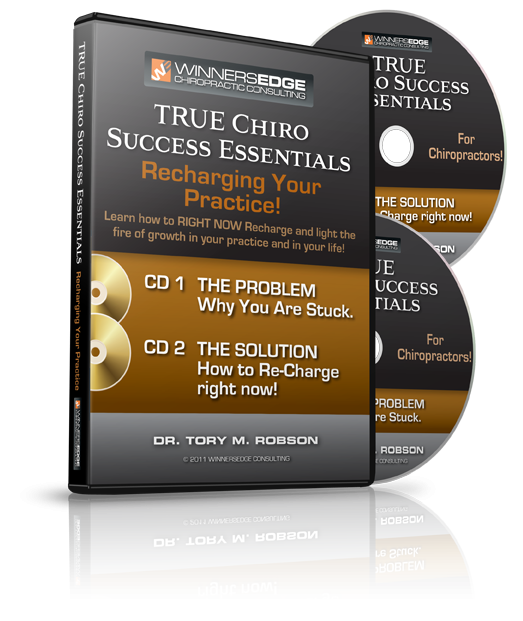 Dr. Robson explains step by step how to fire up your practice! How to get lean, how to get EXCITED, how to get energized, how to get thankful, how to create a New Patient surge, how to feel better, and tons more! It really isn't that difficult. It is simply a matter of doing a few things RIGHT NOW to create that new and exciting velocity! Owning a perfectly scripted and memorized Report is a REQUIREMENT for success. BONUS CD: Re-sign and Referral Repetition! Learn the RAPID FIRE Debt Elimination System. The best way for DC’s to crush debt and end monthly payments. Learn how to save money pre-tax and post-tax with the Money Saving Vortex Concept. Your Secret Weapon to wealth. 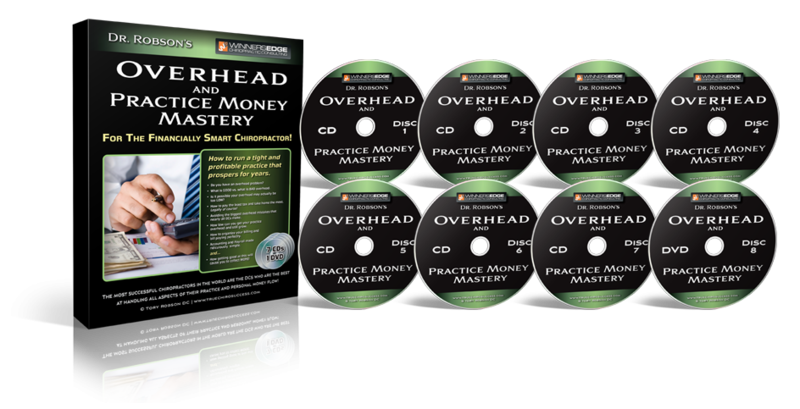 This may be the most VALUABLE money training you will EVER have. Save tens if not hundreds of thousands of dollars in interest alone! If you want to get your financial life in order get these CD’s. Do you want to be in the Top 1% of DC’s in the world? Then you MUST have perfectly scripted, refined, consistent, and powerful procedures. Most Chiros won’t admit that their systems and scripting are weak, even though their stats PROVE they are “winging it.” Leaving them flat-lined and unable to grow. Allow your personality and power to emerge. Lead your patients to better health in a MUCH more consistent and predictable manner and watch your practice skyrocket! Some consider this the best Sub 5-minute Report of Findings on the planet today. Let alone the Consultation, Office Visit, Re-exam, and Re-sign! Strictly for WINNERSEDGE Members Only. 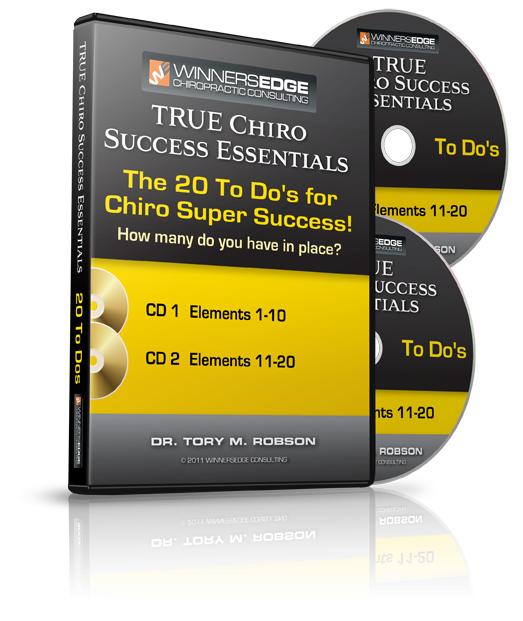 The 20 "To Do's" for Chiro SUPER SUCCESSDo you really, I mean really want to have a BIG practice and a great chiropractic life? With better service, better results, much more income, less overhead, less stress, more savings, and more fun. How many of these 20 Elements do you have in place? How many are you lacking? Find out and fix them now! Does the million dollar practice still exist? YES! 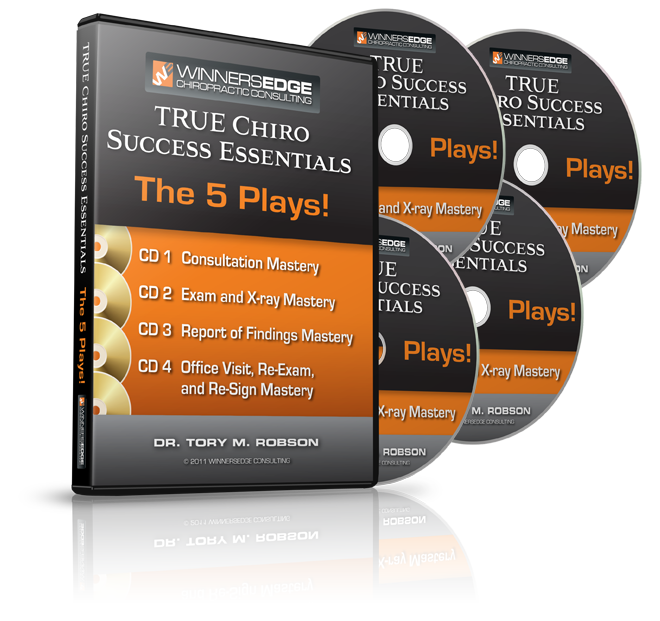 After 20,000+ coaching calls, countless seminars, trainings, books, CDs, videos, and interactions with the top Chiropractors in the country, plus his own personal experience getting to this level and sustaining it, Dr. Robson lays out the critical elements required for you to build your practice to the million dollar level! CD 1: It exists! 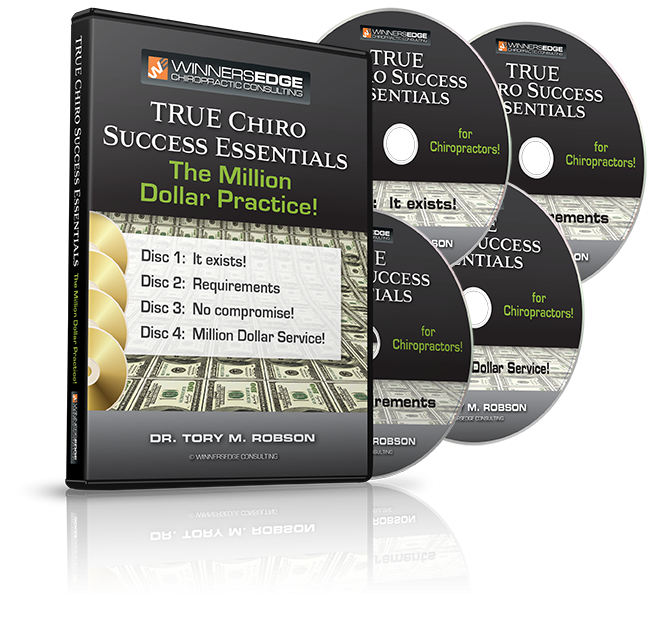 Yes, the million dollar practice is alive and well today, but only if you know exactly how to do it! CD 2: Requirements! The essential components that must all be at peak levels - mindset, procedures, floor plan, staffing, work ethic, philosophy, and much more! CD 3: No compromise! You must have an unwavering and unshakable drive that inspires you to demand the absolute best from yourself and those around you! CD 4: Million Dollar Service! Service, service, service is the key! It's not about the money, it's about helping as many people as you can! This Booklet may be the most important material you ever read as it related to your practice and financial future! Thoughts and solutions for the most difficult practice questions. For practicing chiropractors only. This is the live Seated Cervical Adjusting seminar performed and recorded at Dr. Robson's office! This may be the only DVD set of its kind available today! This is not how to prop people up and do supine style adjustments in a chair! This is real, pure, Gonstead style seated cervical, spinous contact, minimal rotation adjusting focusing on C7, T1 and the Atlas! Dr. Robson gets fired-up about the current health care model – shows piles of research and info giving you the fuel you need to get SERIOUS about your Mission! 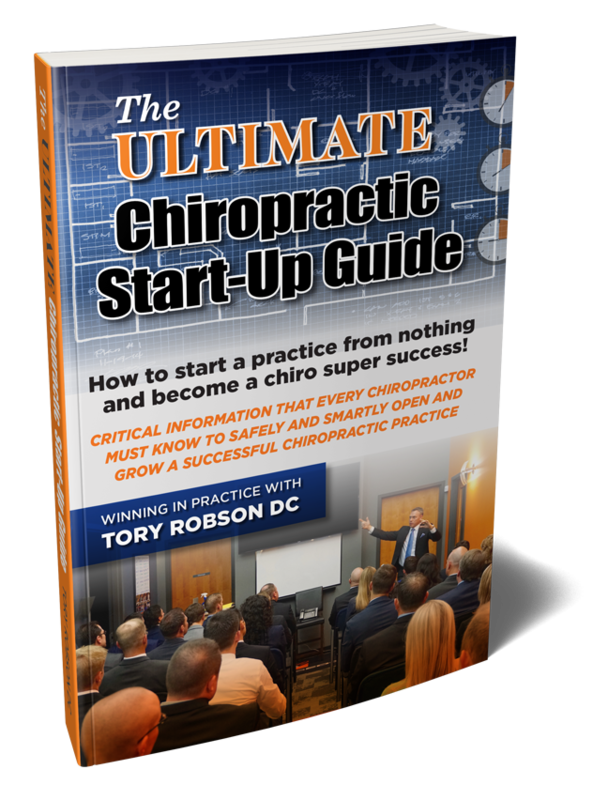 Filmed live at an INSTALL Training – many attending felt this was one of the best Trainings they EVER heard in their Chiropractic life! So here it is on DVD! DVD 1: What the “bleep” is going on in the world of health!? DVD 2: Time for you to think BIGGER! 7 Pillars of Personal and Professional Success. 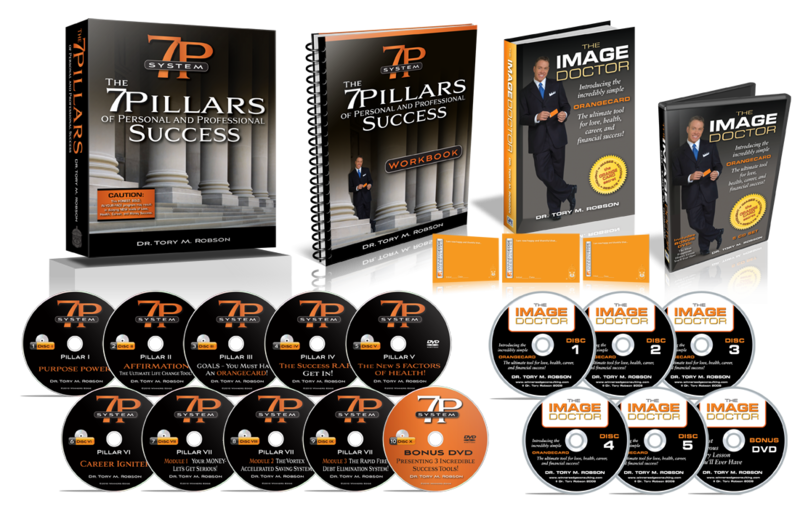 "The 7P SYSTEM"
The ULTIMATE Step-by-Step, Foolproof, No Holds Barred Guide to the Power Life! 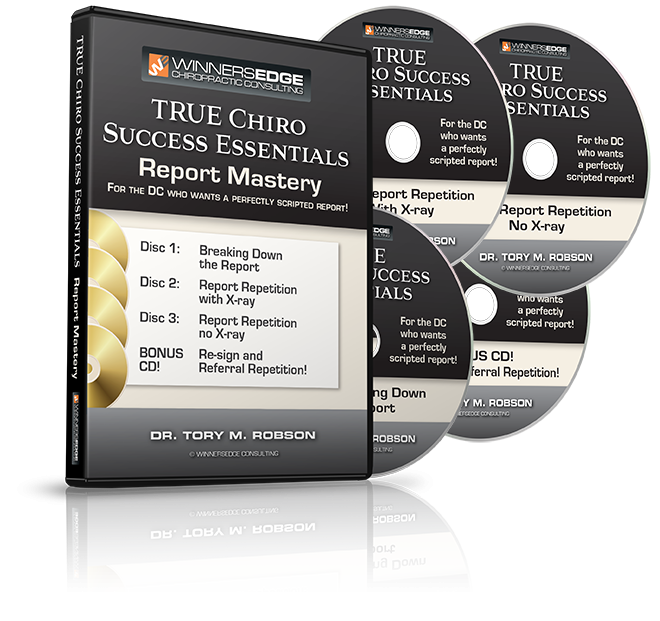 Boiled down from countless books, CD’s, videos, personal experience in practice and consulting this is the definitive video guide to SERIOUS success. Simply watch, follow the included notebook, apply the principles and watch what happens in your life! You MUST learn these 7 Principles – they are NOT optional if you want to grow. Considered by many to be one of the best Success Sets available today, and is the ONLY place you can get the phenomenal ORANGECARD outside a Seminar setting! A Must Have for all Doctors and Non-Doctors alike! 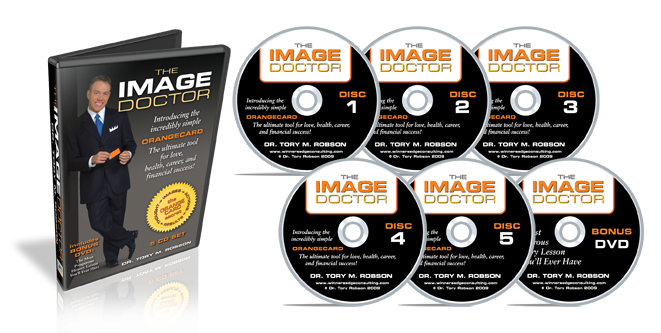 Includes 10 DVD’s, Workbook, 3 ORANGECARD's, PLUS 2 Free Gifts: The Image Doctor Book and 5 CD Audio set including the Bonus DVD! Don't let the title fool you. This 180 page hardcover is about how your Inner Self Image is what is controlling your success to this point in life. And how to elevate it! In Hardcover and Auidio CD read by Dr. Robson himself! 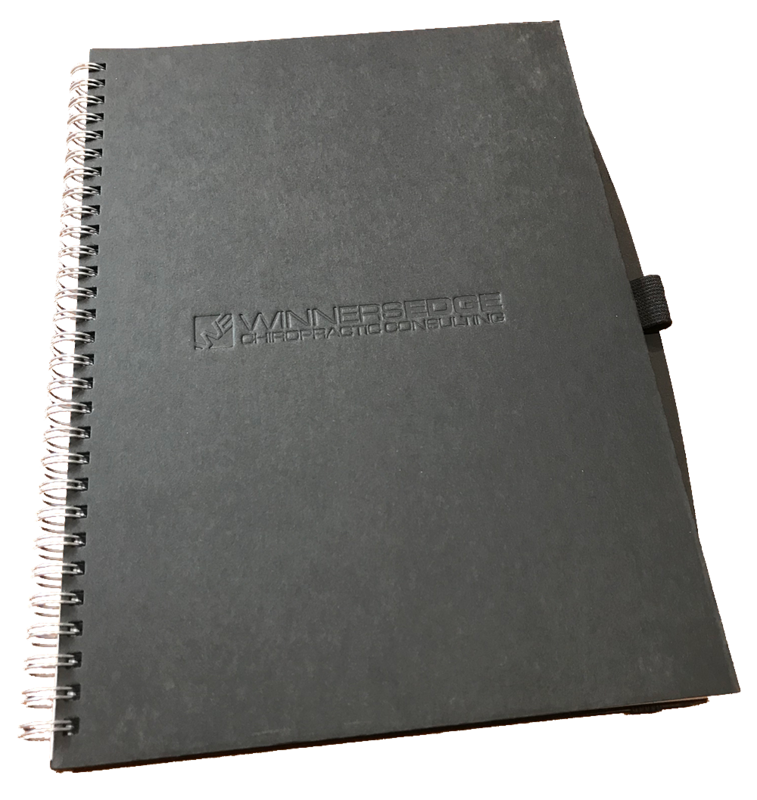 This is a must have notebook to take with you to all WINNERSEDGE Seminars, Trainings and Events! Filled with 70 blank sheets of ruled paper with an elastic closure and a built-in elastic pen loop! Critical information that every Chiropractor must know to safely and smartly open and grow a successful Chiropractic Practice.